Here at Animas Laser Therapy we use only the best, state-of-the-art medical lasers that have received FDA-clearance for a wide range of conditions including pain management. 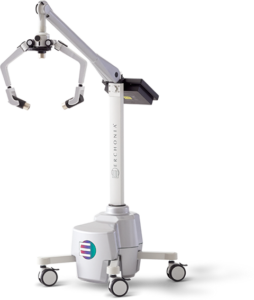 Our equipment operates at a number of various wavelengths and other programmable parameters, allowing us to customize your treatment protocol to best suit your individual needs. Low-Level Laser Therapy (LLLT) improves tissue repair, reduces inflammation, and is great for pain management. LLLT has been used for many years on sports injuries, arthritic joints, neuropathic pain syndromes, and chronic pain of the neck and back. Over 200 randomized clinical trials have been published on LLLT, half of which are specifically on pain. How does LLLT decrease pain? Increases in Endorphin levels, which reduce pain by activating the body’s opioid receptors thereby initiating an analgesic effect. Increases adenosine-triphosphate (ATP). 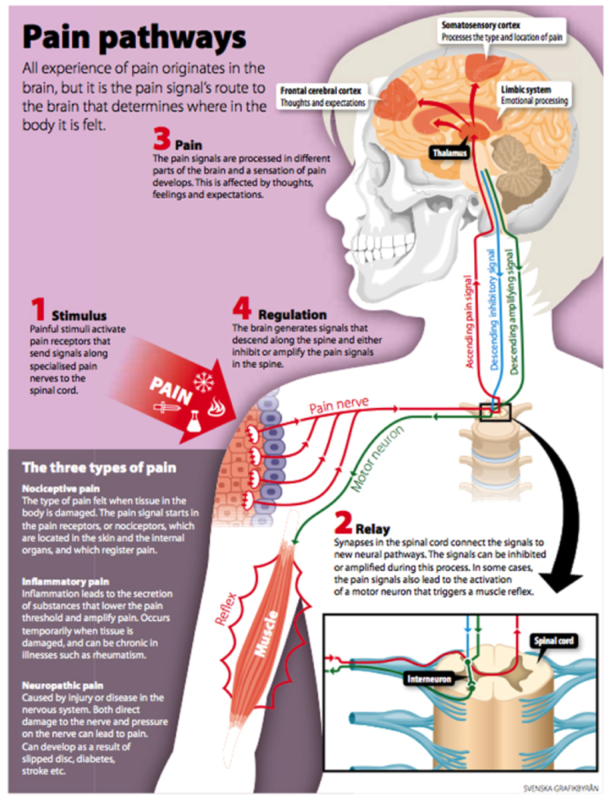 Pain serves as a warning signal to alert us that tissue in the body has been—or is about to be—damaged. When we have increased levels of ATP, our cells can better resolve the tissue damage responsible for the pain. Decreases inflammation. LLLT can mitigate inflammation by increasing the production of anti-inflammatory products (such as prostaglandins) and decreasing pro-inflammatory products (such as interleukin-1). LLLT is superior to anti-inflammatory steroids because the steroids have the negative effect of impairing cellular proliferation, which is needed to repair the damaged tissue causing the pain. Unlike steroids, LLLT’s therapeutic window for anti-inflammatory effects overlaps with its ability to repair damaged tissue. Blocks the firing (depolarization) of neurons responsible for the sensation of pain (C-fiber afferent nerves). This prevents the pain signal from traveling to the brain from the site of injury. Normalizes neuronal action potential. Normally functioning neurons operate at about -70 mV and fire (depolarize) at about -20 mV. The membrane potential (electrical charge) of damaged neurons is closer to -20 mV, thereby resulting in overstimulation and a subsequent increase in pain stimulus. LLLT helps restore the action potential closer to the normal -70 mV range, which will eliminate the pain associated with neuronal hyperactivity. Decreases Bradykinin levels. Bradykinins stimulate pain pathways (nociceptive afferents) in the skin and viscera. LLLT reduces elevated levels of bradykinin, resulting in pain reduction. Figure 1. 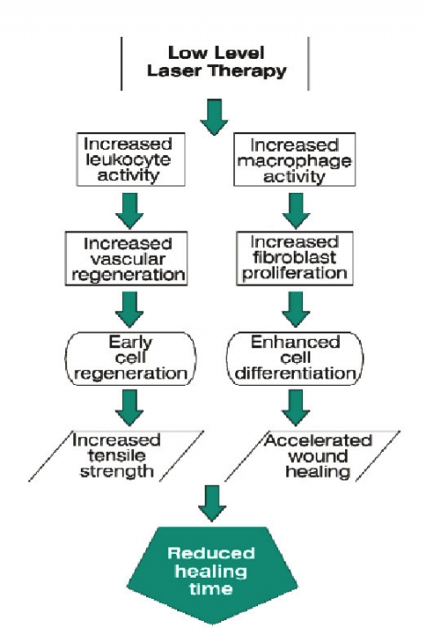 LLLT cellular cascade effects on accelerated tissue healing. Source: Martin R. (2003). Laser-accelerated inflammation/pain reduction and healing. Practical Pain Management, 3(6). Administered by one of our educated and well-trained technicians, treatments take 10-20 minutes and should be applied two or more times a week. The duration of your treatment program depends upon the extent and age of the injury. While some patients notice improvements after only one or two treatments, more severe cases may take up to 10-12 treatments before substantial progress is made. 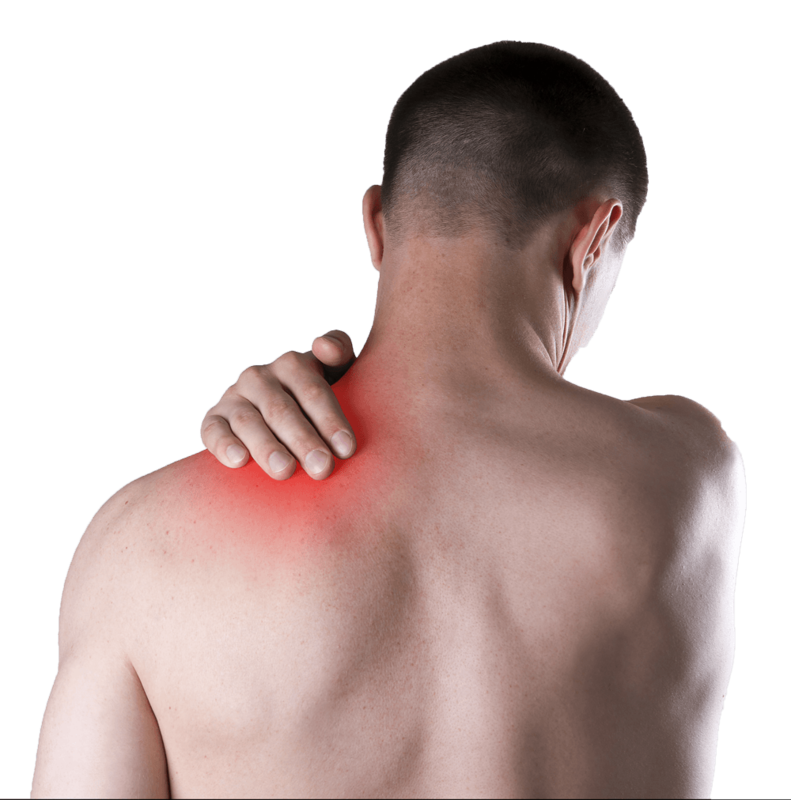 At this point, we will work to scale back the number of treatments necessary for you to remain pain free.